The San Francisco Giants and Oracle today announced they have signed a 20-year partnership providing Oracle with the naming rights to the ballpark through 2038. Beginning today, AT&T Park will be named Oracle Park. Financial terms of the agreement were not disclosed. The Giants’ previous naming rights agreement with AT&T ran through the end of 2019. However, in preliminary renewal discussions, AT&T informed the Giants that changes to AT&T’s corporate sponsorship strategy would give the Giants the opportunity to seek another naming rights partner and begin a new agreement one year early. Oracle immediately stepped up when the Giants proposed the naming rights opportunity and the two parties quickly agreed to terms over the holidays in order to prepare for the 2019 baseball season. 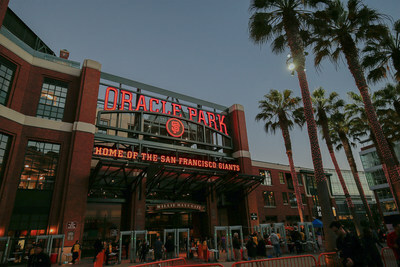 Ballpark Capital & Technology Upgrades: Oracle will partner with the Giants to invest in a number of improvements to Oracle Park over the next five years, including the addition of a new state-of-the-art scoreboard and signage. The Giants and Oracle will also utilize emerging technologies to create unique experiences for fans. Additional ballpark upgrades will be announced in the coming weeks. Community Programs: The Giants and Oracle will develop a signature community outreach program. Hospitality and Experiential: Together Oracle and the Giants will build unique sports hospitality experiences to engage Oracle customers and members of the community. Oracle and the Giants have a longstanding partnership. Together the two companies have embarked on numerous promotional, advertising and philanthropic efforts. For example, for the past 15 years, Oracle sponsored the Giants Community Spotlight, an in-game scoreboard feature, which raises awareness for issues and causes important to the Bay Area community and highlights the impactful work being done by many of the Giants’ non-profit partners. Oracle has been a proud sponsor of Giants Enterprises – the wholly-owned subsidiary of the Giants responsible for the non-baseball and special events for the organization. The annual Oracle OpenWorld CloudFest concerts have been hosted at the stadium for the past three years. Giants Enterprises also delivered the Official Spectator Experience for the 34th America’s Cup held in San Francisco in 2013, which Oracle Team USA won. Giants Enterprises commercialized the three-month international sailing event for the first time in its 160-year history by creating shore-line ticketed products, producing customized hospitality packages, developing a spectator-boat license program and managing end-to-end sales, customer service and event execution. An integrated marketing campaign delivered sold-out dates, record-breaking sales and incremental revenue through dynamic pricing.